Friability (the condition of being friable) is the ability of a solid substance to be reduced to smaller pieces with little effort. Friability Testing is a measure of the resistance of the tablets to shipping and abrasion by tumbling them in a rotating drum with a certain speed. After tumbling, the integrity of the tablets and the weight loss are evaluated. Pharmtest has the PTF series available. With this equipment it is possible to measure in two modes: a specific time interval or a specified number of rotations with fixed or variable speed. PTFE and PTFER, single or double drum Tablet Friability Testing instruments. Both are available as fixed or variable speed instruments and are manufactured in compliance to the monographs of theUSP <1216>, European EP <2.9.7> and other Pharmacopoeias. The PTFE Instruments are manufactured with either one or two drums, both Friability (“Roche”) and (optionally) Abrasion drums are available. 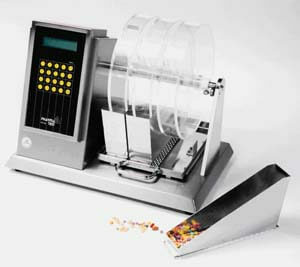 AS a Friabilty Tester is often used in production its stainless steel housing fits ideally. The tested samples are automatically discharged into individual stainless steel collectors without having to remove the drums from their axis. Using the PTFDR instruments an Analytical Balance can be connected to the COM port of the PTFDR to perform the Weight test prior and after Friability testing. A report is printed if a suitable PCL or DOT Matrix printer is connected to the printer port. Since a friabilty testing instrument is often used in production, its stainless steel housing from PharmaTest fits ideally.